My friend Paul Scott attended the unveiling of the new Tesla S Class Sedan, the all electric 4 door luxury sedan that should be available in 2011. Very cool looking. Check out what he has to say. I just got back from Space X, Elon Musk's rocket factory in Hawthorne, CA where the unveiling of the much anticipated Tesla Model S was held. In a word - WOW, this is a gorgeous car! Lots of rumors have been floating around for the past two years about the Model S, so I expected something close to what I saw, but the actual car exceeded my expectations. First, the styling is sleek without being too flashy (see the Fisker Karma for my definition of too flashy). The drag coefficient is a very respectable .25, less than even the Tesla roadster. This will come in handy if you want to take her up to a top speed of 130 mph. 0-60 is a screaming 5.5 seconds, not bad for a family car. They will also offer a "sport version" with a 0-60 under 5 seconds. Do NOT let your teenager drive this car! 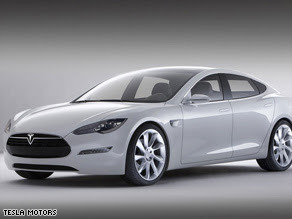 The big news for me was that the Model S will be offered with three different sized battery packs: 160 miles; 230 miles; 300 miles. The base priced model of 160 mile range is going to sell for $57,400, and after the $7,500 federal tax credit nets out at $49,900. No news on the price of the longer range models, but I can guarantee that the 160 mile model will be their biggest seller. There's very little need for the longer range car, so why pay (presumedly) thousands more and carry the extra weight around? BTW, the base model will weigh in around 4,000 lbs. I asked Tesla's Chief Technical Officer, J.B. Strauble, whether they would be using the same battery tray for all three options and he confirmed they would. The 160 mile version will not use all the room in the tray, the 230 mile version would be full and the 300 mile version would be using a different type of LiIon battery with more energy capacity. While J.B. was unable to divulge the battery company by name, he did say it was a name we'd recognize and was based in Japan. I asked Elon about the battery warranty, life expectancy and replacement cost. He says the warranty will be 4-5 years for the whole car, they expected the battery pack to last 7-10 years and the replacement cost would be under $500 kWh. I did not get the kWh capacity of the pack, sorry. I'd guess the base model would need at least 30-35 kWh for 160 miles. That's around $3.00 worth of electricity for 160 miles. The first cars will roll off the factory floor in late 2011, but that's premised on Tesla getting the loan from the feds they are seeking. Elon talked about two options for the loan. One is almost a sure thing for $250 million and the other was for $350 million. Between the two, he felt sure of getting one of them. Since the U.S. is loaning billions to the failed Detroit three, I have no problem with a company making fully electric cars getting $350 million. They need the money to build the factory, hopefully here in SoCal where we could use the jobs.